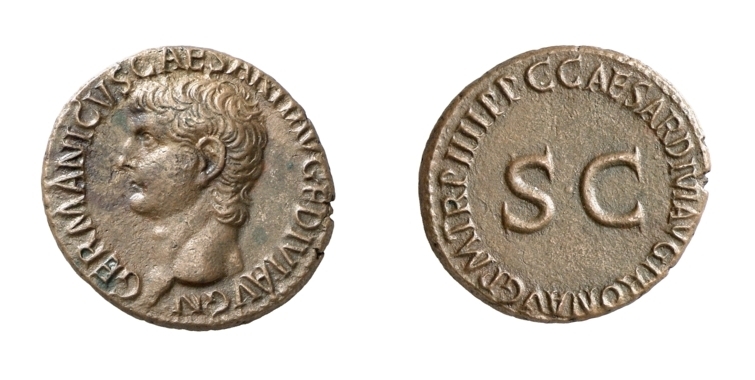 Roman Imperial Coinage - Caligula (16 March AD 37 - 24 January AD 41). 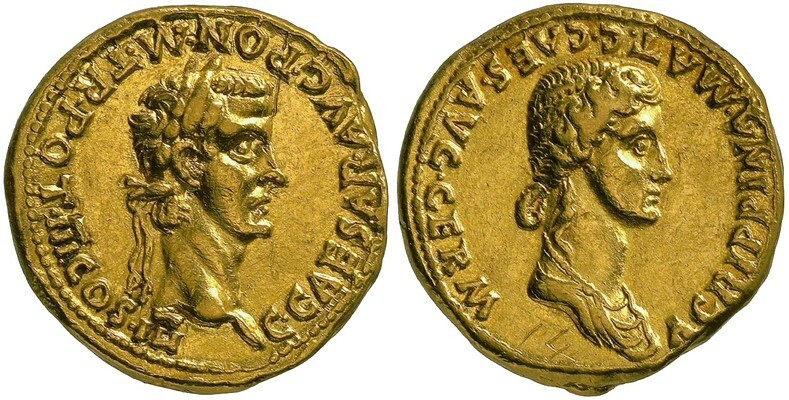 Aureus, Lugdunum 37-38, AV 7.90 g.
C CAESAR AVG GERM P M TR POT COS Bare head of Gaius r. Rev. Radiate head of Augustus r., between two stars. RIC 1. BMC 1. C 10. CBN 1. Kent-Hirmer 165. Calicó 336. Ex Leu sale 18, 1977, 293. 2 Denarius, Lugdunum 37-38, AR 3.77 g.
RIC 2. BMC 4. C 11. CBN 3. 4 Denarius, Lugdunum 37-38, AR . C CAESAR AVG GERM P M TR POT Bare head of Gaius r. Rev. DIVVS AVG PATER PATRIAE Radiate head of Augustus r.
5 Quinarius, Lugdunum circa 37-38, AV 3.85 g, 11h. 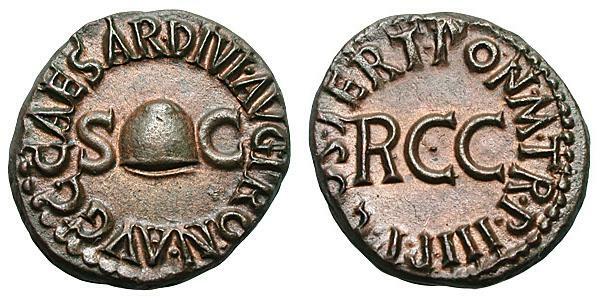 C CAESAR AVG GERMANICVS Bare head of Gaius r. Rev. P M TR POT COS Victory, draped, seated right on globe, holding wreath in both hands. Left wing visible behind right. 7 Aureus, Lugdunum circa 37-38, AV 7.71 g, 1h. C CAESAR AVG GERM P M TR POT Bare head of Gaius r. Rev. PAGRIPPINA MAT C CAES AVG GERM Draped bust of Agrippina r., hair falling in queue down her neck. 8 Denarius, Lugdunum circa 37-38, AR 3.73 g.
C CAESAR AVG GERM P M TR POT Bare head of Gaius r. Rev. AGRIPPINA MAT C CAES AVG GERM Draped bust of Agrippina r., hair falling in queue down her neck. C 24. BMC 8. CBN 12. RIC 8. 9 X AV Aureus, Lugdunum 37-38. 10 AR Denarius, Lugdunum 37-38, AR 3.67 g, 12h. 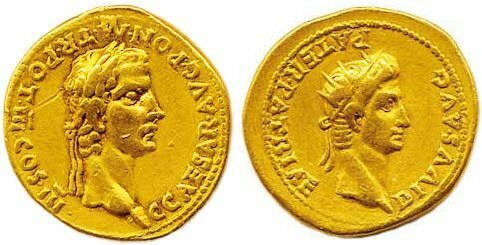 11 AV Aureus, 37/8, Lugudunum. 7,77g. C CAESAR AVG GERM P M TR POT. Bare head of Gaius r.; Rev: GERMANICVS CAES P C CAES AVG GERM. 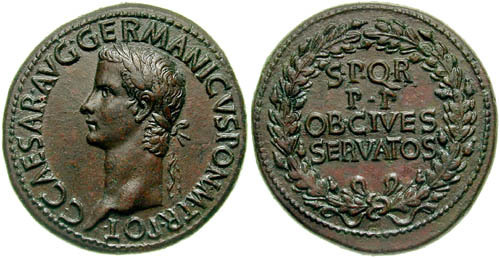 Bare head of Germanicus r.
RIC 11; BMCRE 11; BN 14; Calicó 322. St. 2. 12 AR Denarius, 37/8, Lugudunum. 13 Aureus 37-38, AV 7.77 g.
C CAESAR AVG GERM P M TR POT Laureate head of Gaius r. Rev. AGRIPPINA MAT CAES AVG GERM Draped bust of Agrippina r.
RIC 13. BMC 14. C 1. CBN 22 (Lugdunum, this reverse die). Kent-Hirmer 166. Trillmich pl. 1, 40. Calicó 326 (this coin). 14 AR Denarius (18mm, 3.88 gm, 4h). Rome mint. Struck 37-38 AD. C CAESAR AVG GERM P M TR POT, laureate head of Gaius (Caligula) right. Rev. AGRIPPINA MAT C CAES AVG GERM, draped bust of Agrippina right. RIC I 14; Trillmich type 1/2; BMCRE 15; RSC 2. 15 Aureus 37-38, 7.73 g.
RIC 15. BMC 16. C 1. CBN 19. Vagi 310. Calicó 332 (this coin). 16 Denarius 37-38, AR 3.76 g.
C CAESAR AVG GERM P M TR POT Laureate head of Gaius r. Rev. 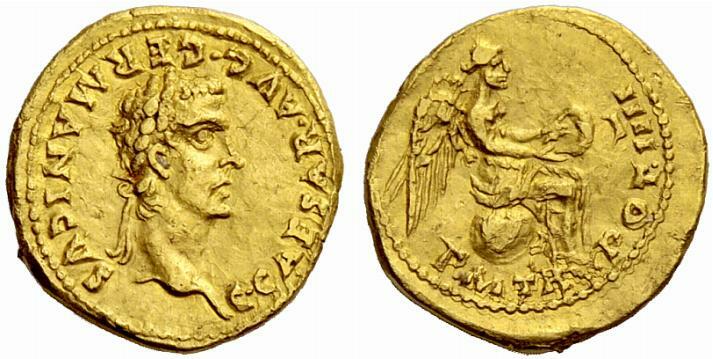 DIVVS AVG PATER PATRIAE Radiate head of Augustus r.
17 Aureus (Gold, 7.76 g 3), 37-38. C CAESAR AVG GERM P M TR POT Laureate head of Caligula to right. Rev. GERMANICVS CAES P C CAES AVG GERM Bare head of Germanicus to right. References: Biaggi 190. BMC 18. BN 27. Calicó 321. C. 1. Giard 171. RIC 17. Vagi 507. 18 Denarius, Lugdunum, 37-38. 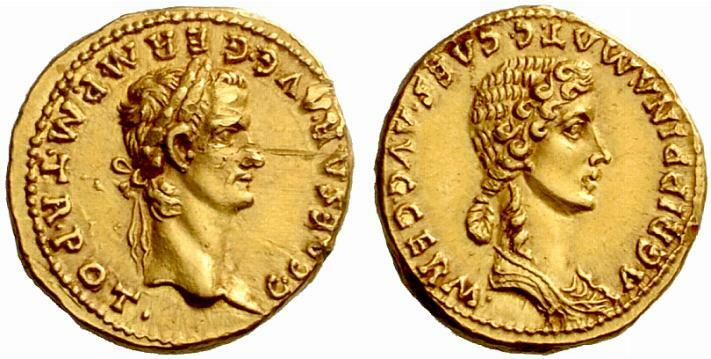 3,71 g.
C CAESAR AVG GERM PM TR POT Laureate head of Caligula to right. Rev. 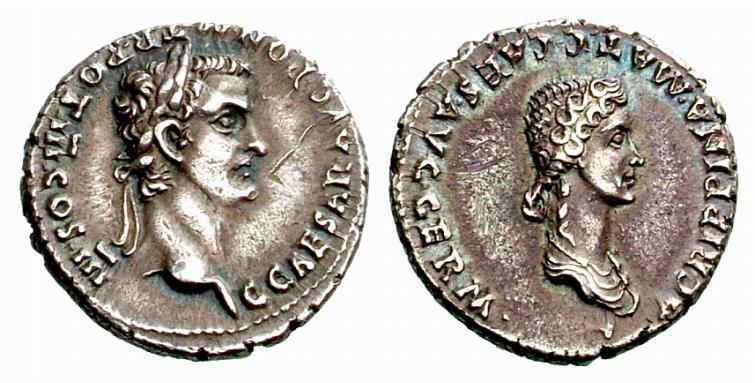 GERMANICVS CAES P C CAES AVG GERM Bare head of Germanicus to right. BN II, 63, 28. RIC 109, 18 (Rom). C. 2. Giard, Lyon 139, 172. 19 Denarius, Lugdunum, 37-38. 3,63 g, 8h. C CAESAR AVG GERM PM TR POT Laureate head of Caligula to right. Rev. SPQR / P P / OB CS within oak-wreath. 19 var Aureus, Lugdunum circa 37-38, AV 7.66 g.
C CAESAR AVG GERM P M TR POT Laureate head r. Rev. S P Q R / P P / OB C S within oak-wreath. 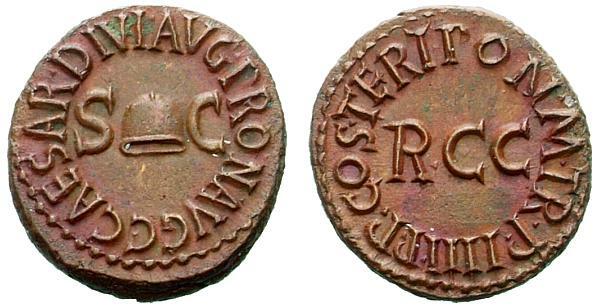 G. Riccio, Ripostiglio di monete d’oro dell’alto impero, PNS 1869, p. 149, 21 (this coin?). Calicó 328 (this coin). Giard Lyon 173. C 18. BMC p. 148, note *. CBN –. RIC –, cf. 19 (denarius). RIC (first edition) 4. 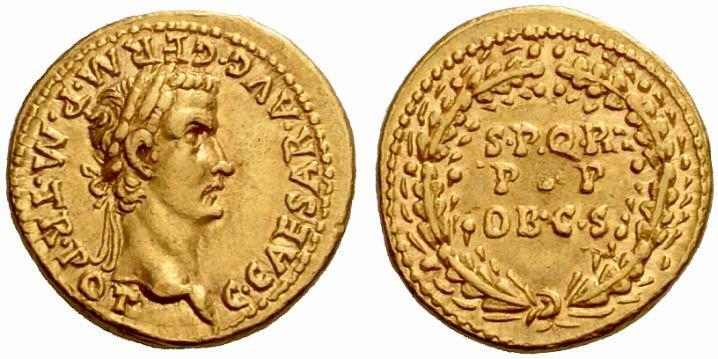 21 AV Aureus (7.82 gm). Lugdunum (Lyon) mint. Struck circa 40 AD. 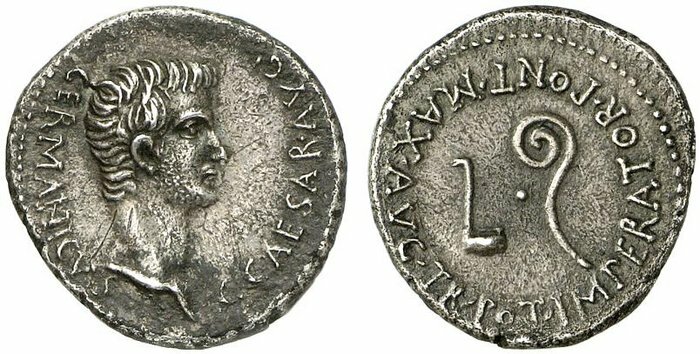 C CAESAR AVG PON M TR POT III COS III, laureate head of Caligula r. Rev : AGRIPPINA MAT C CAES AVG GERM Draped bust of Agrippina r.
22 Denarius 40, AR 3.72 g.
C CAESAR AVG PON M TR POT III COS III Laureate head of Caligula r. Rev. AGRIPPINA MAT C CAES AVG GERM Draped bust of Agrippina r.
C Agrippina Senior and Gaius 6. BMC 34. RIC 22. CBN 33. 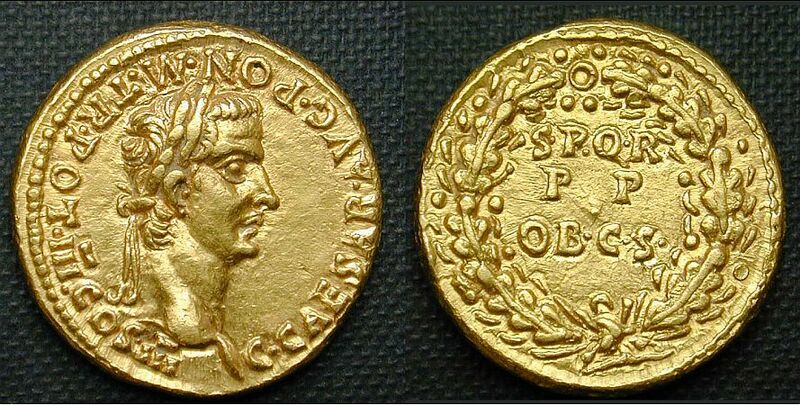 23 Aureus, Lugdunum 40, AV 7.62 g.
C CAESAR AVG PON M TR POT III COS III Laureate head of Caligula r. Rev. 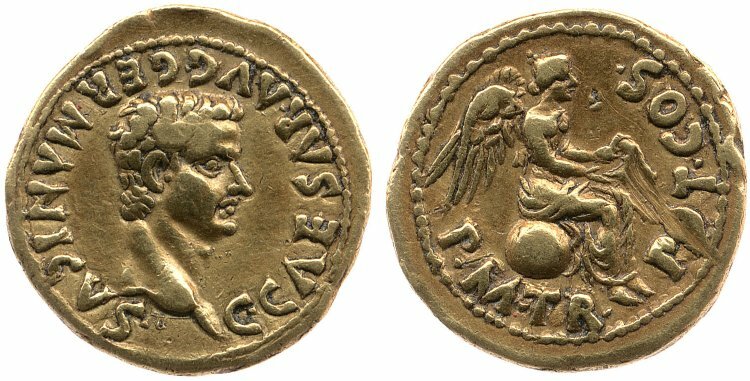 DIVVS AVG PATER PATRIAE Radiate head of Augustus r.
Calicó 334. C 6. BMC 24. RIC 23. 24 AR Denarius (3.65 gm). Rome mint. Struck 40 AD. C CAESAR AVG PON M TR POT III COS III Laureate head of Caligula right. Rev. 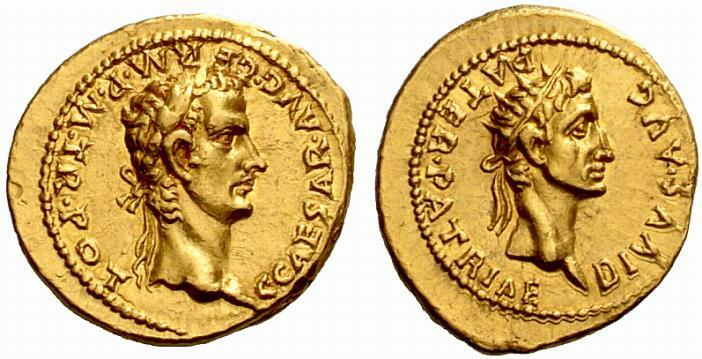 DIVVS AVG PATER PATRIAE Radiate head of Augustus right. RIC I 24; RSC 7. 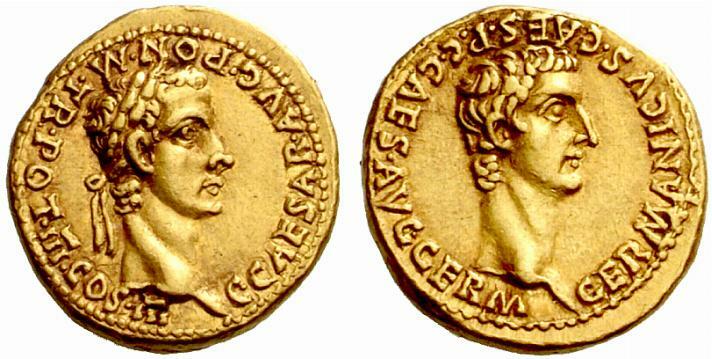 25 Aureus 40, AV 7.79 g.
C CAESAR AVG PON M TR POT III COS III Laureate head of Gaius r. Rev. GERMANICVS CAES P C CAES AVG GERM Bare head of Germanicus r.
RIC 25. BMC 26. C 6. 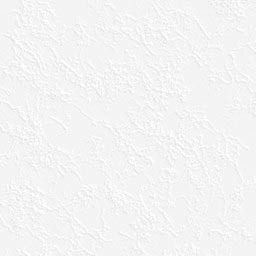 CBN -. Calicó 324. 27 Aureus, 7,75 g. Roma & Lugdunum, 40 A.D.
C. CAESAR AVG. PON. M. TR. POT. III. COS. III ; Bust of Caligula. Rev. S. P. Q. R. P. P. OB. C. S. ; Oak wreath. Reference: BMC 29; BN 37; Calicó 329; C 20; RIC 27. C CAESAR AVG PON M TR POT III COS III Laureate head of Caligula to right. Rev: SPQR PP OB C S within oak-wreath. 29 AV Quinarius 40-41, AV 3.89 g.
C CAESAR AVG GERMANICVS Laureate bust r. Rev. PM TR POT IIII Victory seated r., holding wreath. C 16. BMC 31. RIC 29. CBN 184. King 3c (this coin). Unlisted AR Denarius (3.62 g, 6h). Rome mint. Struck January 41 AD. C CAESAR AVG PON M TR POT IIII COS IIII, laureate head of Gaius (Caligula) right. Rev. S P Q R/P P/OB C S in three lines within oak wreath. RIC I -; RIC I (1st ed.) 7 = BMCRE 32 = RSC 23a; Lyon -; BN -; Cohen -. 30 AR Denarius 41, AR 3.35 g.
C CAESAR AVG PON M TR POT IIII COS IIII, Laureate head of Gaius r. Rev. AGRIPPINA MAT C CAES AVG GERM Draped bust of Agrippina r.
C 7. BMC p. 150 note †. RIC 30. CBN –. C. CAESAR AVG. PON. M. TR. POT. IIII. COS. IIII Laureate head of Caligula right. Rev. 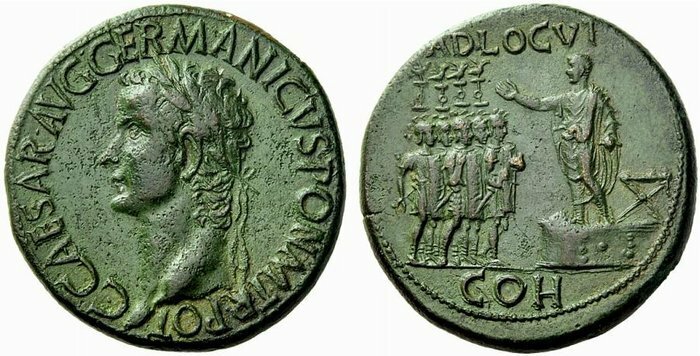 DIVVS AVG PATER PATRIAE Radiate head of Augustus r.
32 Sestertius circa 37-38, Æ 26.63 g.
C CAESAR AVG GERMANICVS PON M TR POT Laureate head l. Rev. ADLOCVT Gaius, bare-headed and togate, standing l. on platform before low stool, haranguing with r. hand extended to five soldiers holding shields and aquilae. In exergue, COH. C 1. BMC 33. RIC 32. CBN 45. 33 Sestertius circa 37-38, Æ 27.67 g.
C CAESAR AVG GERMANICVS PON M TR POT Laureate bust l. Rev. AGRIPPINA - DRVSILLA - IVLIA The sisters of Gaius standing facing: Agrippina, as Securitas, holds cornucopiae in r. hand resting on column, with l. hand on shoulder of Drusilla, as Concordia, who holds patera and cornucopiae; Julia, as Fortuna, holds rudder and cornucopiae. In exergue, S C.
C 4. BMC 37. RIC 33. CBN 48. Kent-Hirmer pl. 48, 167. 34 Æ Dupondius (15.57 g, 7h). Rome mint. 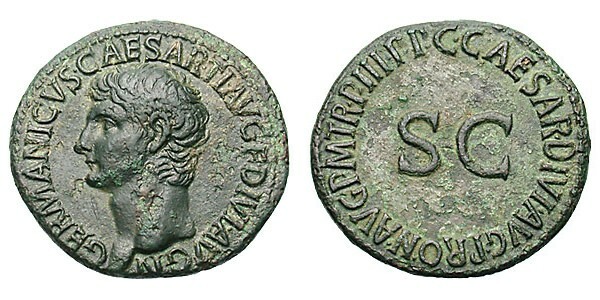 Struck under Gaius (Caligula), 37-38 AD. NERO ET DRVSVS CAESARES, Nero and Drusus on horseback riding right. Rev. C CAESAR AVG GERMANICVS PON M TR POT, large S C across field. RIC I 34 (Gaius); BMCRE 44 (Caligula); BN 52 (Caligula); Cohen 1. 35 As circa 37-38, Rome. 11,85 g, 7h. GERMANICVS CAESAR TI AVGVST F DIVI AVG N Bare head of Germanicus to l. Rev. C CAESAR AVG GERMANICVS PON M TR POT round large S C.
RIC 35. BMC 49. C. 1. 36 Sestertius, 37-38. AE 28.89 g.
C. CAESAR. AVG. GERMANICVS. P. M. TR. POT. / PIETAS Pietas, draped and veiled, seated l., holding patera in her outstretched r. hand, her l. arm resting on small, facing female statuette (Spes?) on rectangular base. Rev. DIVO - AVG / S-C In front of a garlanded, hexastyle temple, Caligula standing l., togate and veiled, holding in his r. hand patera over square, garlanded altar; behind him, attendant, holding patera in his lowered l. hand; in front of the altar, victimarius r., wearing short tunic, slitting throat of a bull standing l.
RIC 111, 36. C. 9. BN II, 66, 51. 37 Æ Sestertius (31.57 gm). Struck 37-38 AD. C CAESAR AVG GERMANICVS PON M TR POT, laureate head left. Rev. S P Q R/ P P / OB CIVES / SERVATOS in four lines with oak wreath. RIC I 37; BMCRE 38; BN 50; Cohen 24. 38 As circa 37-38, Æ 12.06 g.
C CAESAR AVG GERMANICVS PON M TR POT Bare head l. Rev. VESTA / S - C Vesta, diademed and veiled, seated l. on ornamental throne, holding patera and long transverse sceptre. C 27. BMC 47. CBN 54. RIC 38. 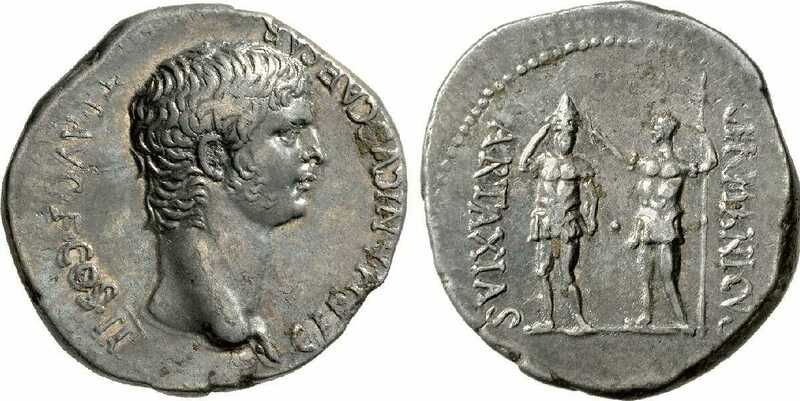 39 Quadrans circa 39 AD, 3.19 g.
C CAESAR DIVI AVG PRON AVG Pileus between S - C. Rev. PON M TR P III P P COS DES III roud RCC ( = remissa ducentessima). BMC 57; Coh. 5; RIC 39. 40 Sestertius 39/40, Rome. 28,79 g.
C CAESAR DIVI AVG PRON AVG P M TR P III P P Laureate head to l. Rev. ADLOCVT / COH Caligula standing to l. on platform, addressing five soldiers with helmets, shields, parazonia and two with aquila. RIC 40. BMC -. C. 2. 41 X Sestertius circa 39-40. C CAESAR DIVI AVG PRON AVG P M TR P III P P Laureate bust l. Rev. AGRIPPINA - DRVSILLA - IVLIA The sisters of Gaius standing facing: Agrippina, as Securitas, holds cornucopiae in r. hand resting on column, with l. hand on shoulder of Drusilla, as Concordia, who holds patera and cornucopiae; Julia, as Fortuna, holds rudder and cornucopiae. In exergue, S C.
42 Æ Dupondius (15.64 g, 6h). Rome mint. AD 39-40. NERO ET DRVSVS CAESARES, Nero and Drusus on horseback riding right. Rev. C. CAESAR. DIVI. AVG. PRON. AVG. P. M. TR. P. III. P. P. around large S. C.
RIC I 42 (Gaius); BMCRE p. 156, n. ‡; BN -; Cohen -. 43 As. Rome mint. AD 39-40. 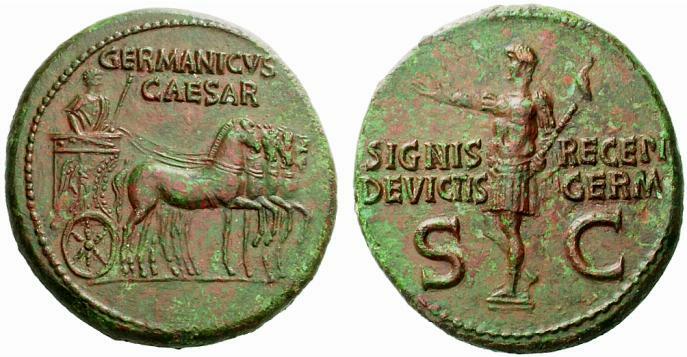 GERMANICVS CAESAR TI AVGVST F DIVI AVG N Bear head of germanicus left. Rev : C. CAESAR. DIVI. AVG. PRON. AVG. P. M. TR. P. III. 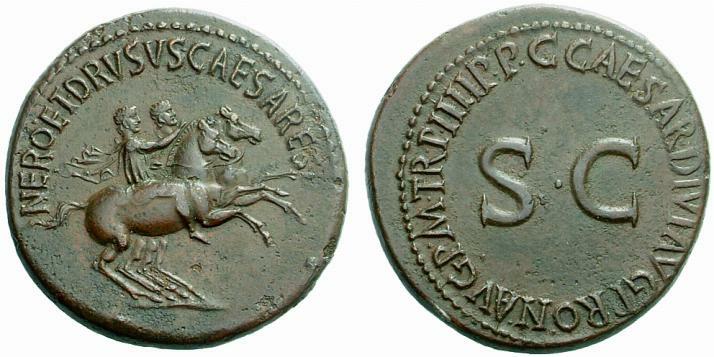 P. P. around large S. C.
44 Sestertius, circa AD 39-40. 27,36 g.
CAESAR DIVI AVG PRO N. AVG. P. M. T.R. P. III P. P. / PIETAS Pietas draped and veiled seated left on throne, holding patera in right hand, left arm wrestling on small figure. Rev. Rev. DIVO - AVG / S-C In front of a garlanded, hexastyle temple, Caligula standing l., togate and veiled, holding in his r. hand patera over square, garlanded altar; behind him, attendant, holding patera in his lowered l. hand; in front of the altar, victimarius r., wearing short tunic, slitting throat of a bull standing l.
RIC 111, 44. C. 11. BN II, 71, 104. 45 Copper quadrans (3.76 gm). Rome, 39-40 AD. C CAESAR DIVI AVG PRON AVG, pileus flanked by S C. Rev. PON M TR P III P P COS TERT around letters RCC. BMCRE 64. CBN 107. Cohen 7. RIC 45. 46 Sestertius, 39-40. Æ 25.2 g, 6h. C CAESAR DIVI AVG PRON AVG PM TR P III P P Laureate head l. Rev. S P Q R/ P P / OB CIVES / SERVATOS in four lines with oak wreath. 47 Dupondius (15.86 gm). Rome, 39-40 AD. C CAESAR AVG GERMANICVS PON M TR P III PP Bare head of Caligula, left. Rev : Vesta, draped and veiled, seated left on throne holding patera and transverse sceptre; above, VESTA, S-C to left and right. 48 Sestertius, 40-41. AE 26.96 g.
C CAESAR DIVI AVG PRON AVG PM TR P IIII P P Laureate head l. Rev. ADLOCVT / COH Caligula, togate, standing l. on low podium, his r. hand raised, adressing to four soldiers standing in front of him, each one with helmet, sword, shield and standard; behind emperor, chair. RIC 111, 48. C. 3. BN II, 73, 115. 49 Dupondius 40-41, Æ 15.52 g.
NERO ET DRVSVS CAESARES Nero and Drusus riding r., with cloaks flying. Rev. C CAESAR DIVI AVG PRON AVG P M TR P IIII P P round S C.
RIC Gaius 49. BMC Gaius 70. CBN Gaius 120. C 2. 50 As 40-41, 11.36 g.
GERMANICVS CAESAR TI AVG F DIVI AVG N Bear head of germanicus left. Rev : C. CAESAR. DIVI. AVG. PRON. AVG. P. M. TR. P. IIII. P. P. around large S. C.
RIC Gaius 50var (AVG on obverse). 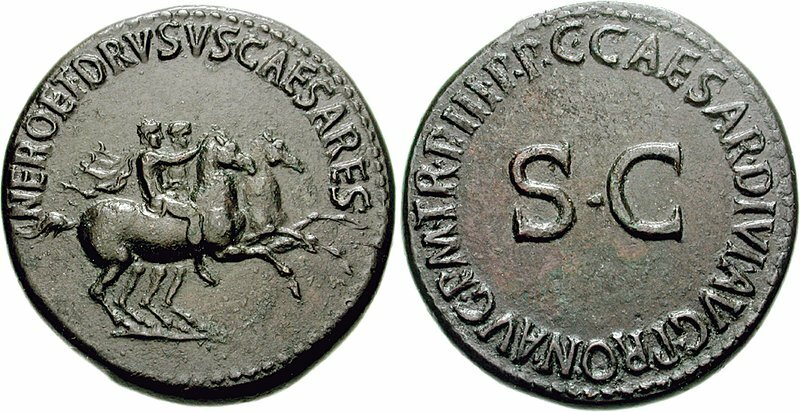 51 Sestertius, circa AD 39-40. 29,37 g.
C CAESAR DIVI AVG PRO N. AVG. P. M. T.R. P. IIII P. P. / PIETAS Pietas draped and veiled seated left on throne, holding patera in right hand, left arm wrestling on small figure. Rev. Rev. DIVO - AVG / S-C In front of a garlanded, hexastyle temple, Caligula standing l., togate and veiled, holding in his r. hand patera over square, garlanded altar; behind him, attendant, holding patera in his lowered l. hand; in front of the altar, victimarius r., wearing short tunic, slitting throat of a bull standing l.
RIC 111, 51. BMC 69. 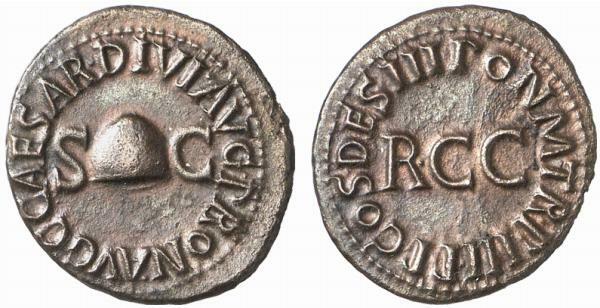 52 Quadrans circa 40-41, Æ 3.26 g.
C CAESAR DIVI AVG PRON AVG around pileus between S – C. Rev. PON M TR P IIII P P COS TER around RCC. C 7. BMC 64. CBN 109. RIC 52. 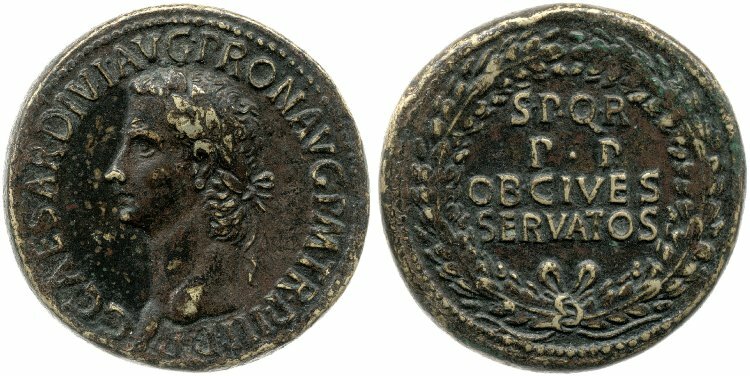 53 Sestertius 40-41, Æ 30.15 g.
C CAESAR DIVI AVG PRON AVG P M TR P IIII P P Laureate head l. Rev. S P Q R / P P / OB CIVES / SERVATOS within wreath. RIC 53. BMC p. 157, note *. C 26. CBN 116. 54 Dupondius. Rome, 39-40 AD. C CAESAR DIVI AVG PRON AVG P M TR P IIII P P Bare head of Caligula, left. Rev : Vesta, draped and veiled, seated left on throne holding patera and transverse sceptre; above, VESTA, S-C to left and right. 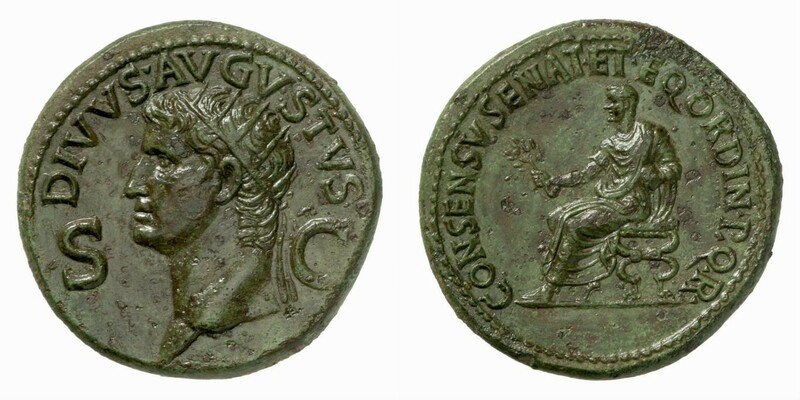 55 Sestertius 37-41, Æ 30.51 g.
AGRIPPINA M F MAT C CAESARIS AVGVSTI Draped bust r., hair falling in long plait behind. Rev. S P Q R / MEMORIAE / AGRIPPINAE Carpentum with ornamented side drawn l. by two mules; the cover supported at the corners by standing figures. C 1. BMC Gaius 85. CBN Gaius 128. RIC Gaius 55. Kent-Hirmer pl. 47, 164. 56 Dupondius. Rome, 39-40 AD. DIVVS AVGVSTVS S-C Laureate head of Augustus, left. Rev : CONSENSV SENAT ET EQ ORDIN P Q R Augustus laureate and togate left, seated on curule chair, holding in right hand. Glossy green patina and extremely fine. 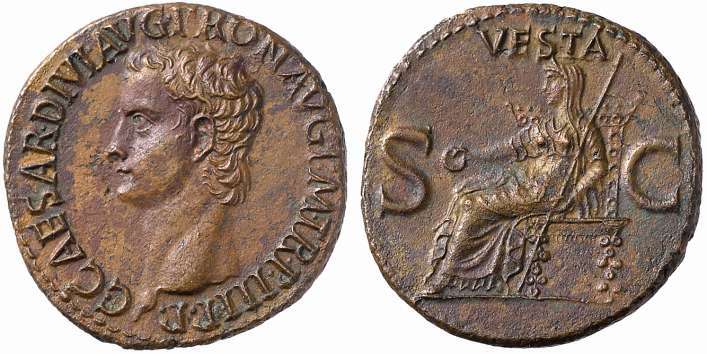 57 Dupondius circa 37-41, æ 15.79 g.
GERMANICVS / CAESAR Germanicus, bare-headed and cloaked, standing in ornamented slow quadriga r., holding eagle-tipped sceptre. Rev. SIGNIS – RECEPT / DEVICTIS – GERMA / S – C Germanicus, bare-headed and cuirassed, standing l., holding eagle-tipped sceptre in l. hand and raising r.
C 7. BMC Gaius 93. CBN Gaius 140. RIC Gaius 57. 58 AE As. circa 37-41, 12,48 g.
M AGRIPPA L – F COS III Head of Agrippa left with rostral crown. Rev: SC Neptune standing slightly left, holding dolphin and trident..
RIC 58 (Caius). BMC 161 (Tiberius). C. 3. 59 AR Didrachm. Caesarea in Cappadocia Circa 37-38, 7,48 g.
RIC 59 (Caligula). C. 6 var. BMC 104 (Caligula). RPC 3629. Sydenham 49. 60 AR Drachm. Caesarea in Cappadocia Circa 37-38, 3,36g. GERMANICVS CAES TI AVGV COS II Γ M Bare head of Germanicus bearded right. Rev: DIVVS AVGVSTVS Radiate of Augustus left. 61 AR Drachm, Caesarea in Cappadocia, 37/38. 3,74g. GERMANICVS C ES TI AVGV COS II Γ M Bare head of Germanicus bearded right. Rev: DIVVS AVGV STVS Radiate of Augustus left. 62 AR Drachm, Caesarea in Cappadocia, 37/38. 3,36g. GERMANICVS CAES TI AVG F COS II MΓ. Bare head of Germanicus bearded right; Rev: DIVVS AVGV STVS. Radiate of Augustus left. RIC (Caligula) 62; RPC I 3623d; Sydenham, Caesarea 51; BMCRE -; BN -; Hunter -, vgl. 38; C. (Germanicus et Auguste) 2. 63 AR Drachm, ca. 37-38. 3,64 g.
C CAESAR AVG - GERMANICVS. Head of Caligula right. Rev: IMPERATOR PONT MAX AVG TR POT. Simpulum and Lituus. RIC 63. C. 12. RPC 3624. Sydenham 48.